Ever since the U.S. Supreme Court opened the door last May for any state to offer Las Vegas-style legal sports betting, the industry has grown exponentially — and also grown to expect a national general-interest spotlight to shine on it. And so it was that on Sunday night both CBS and Showtime offered features on the phenomenon. How did they do? Goldilocks comes to mind. CBS’ 60 Minutes piece was too small, while Showtime — which is offering four one-hour segments on the topic in its series Action — may be going too big. But since there are three more shows to go, maybe it will turn out to be just right. The 60 Minutes piece — the second of three segments for a show that ironically started more than an hour late on the East Coast thanks to the Duke-Central Florida March Madness drama — took the “20,000 foot” approach. It’s interesting that NBA Commissioner Adam Silver — whose league was one of five sports organizations that spent six years suing New Jersey to try to stop the state from offering sports betting — comes off as legal sports betting’s best friend in the piece. Why that directive was not in place just as emphatically for many years, in a country where annual illegal sports betting estimates have ranged from $150 billion to $500 billion, should have been asked. It wasn’t. Vintage 60 Minutes would have had the late Mike Wallace grilling a legendary college football or basketball coach on their salaries. Per USA Today’s coaching pay database, Kentucky’s John Calipari makes $9.3 million, Duke’s Mike Krzyzewski makes $7 million, and Michigan State’s Tom Izzo makes $4.2 million. The players — at least officially — make nothing. But 60 Minutes whiffed on that angle, too. The Meadowlands Racetrack’s FanDuel Sportsbook got a cameo in the piece, as did William Hill US CEO Joe Asher (the only person to appear both on the 60 Minutes segment and Part One of the Showtime series). Where 60 Minutes took the expansive view in a short amount of air time, Showtime took us inside the belly of the beast in its first of four hours on the topic. Sure, there are cameos by Asher, Meadowlands Racetrack operator Jeff Gural, Monmouth Park’s Dennis Drazin, ex-New Jersey state senator Ray Lesniak, and longtime UNLV gaming expert David G. Schwartz (all but Gural have been guests on our Gamble On podcast, by the way). Ubiquitous sports business guy Darren Rovell, who has gravitated over to the sports gambling space, naturally gets his own cameo as well. But the show is driven, appropriately, by gamblers. There are brief and humorous interviews with numerous amateur bettors, and very enlightening shots of their thrills of victory and agonies of defeat. 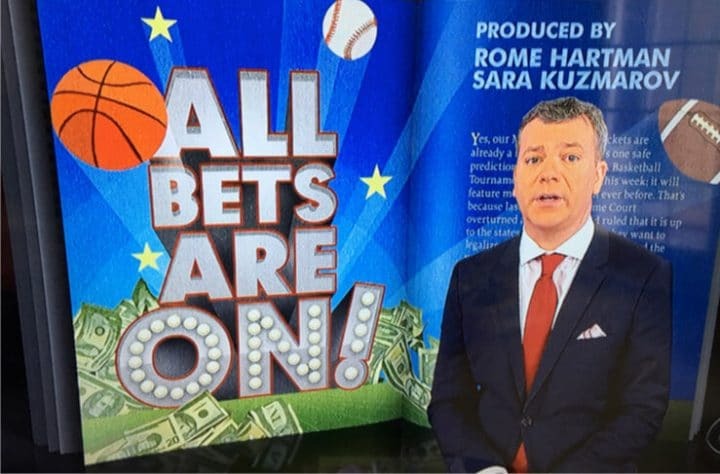 The bulk of the show, though — and thus the barometer on whether industry insiders will find this episode appealing — was dedicated to tout “Vegas Dave” Oancea, handicapper Kelly “Kelly in Vegas” Stewart, and professional sports bettor Bill “Krack” Krackomberger. Vegas Dave checks in at the 15-minute mark, and he is the most controversial of the three, at least based on feedback I have gotten before. More importantly, the show gets legendary broadcaster Brett Musburger — who now is on the sports gambling side of industry with VSiN — and iconic handicapper Jimmy Vaccaro to weigh in. Ok, that issue seems to be exhausted. Yet minutes later, we are back with Vegas Dave as he visits his parents and explains all over again how wonderful he is. Hence my fear that filling four hours on this topic might be a challenge for Showtime. More interesting is Kelly in Vegas. 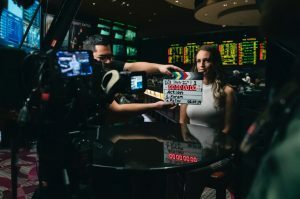 She’s a rare female in the sports betting industry, and the show chronicles her rise from bikini contest winner and casino bottle server to a brand with 37,000 Twitter followers. Kelly clearly hasn’t made it as “big” as she wants just yet, but her efforts and her background made for a compelling segment, at least. The other “star” is Krackomberger, who has a more modest 10,000 followers on Twitter. He’s a middle-aged, stocky bettor who looks like he’s straight out of a casting call for a The Sopranos sequel. And sure enough, it turns out that Bill is from the little Jersey Shore town of Keyport. That seems to suggest that he, well, has friends. Still, the scenes of he and his wife — who knew any of these people would have a spouse? — again generate human interest for a casual viewer. More Fong and less Vegas Dave in future episodes, please — which is possible if compulsive gambling issues get the attention they should in this series. A few minutes was spent explaining to the audience what a point spread is, what a “vig” is. That suggests a hope that non-gamblers will watch an entire four-part series on gambling, which seems ambitious. The episode ended on an intriguing note with another topic that 60 Minutes just didn’t have the time to address: What is the future for those illegal bookmakers? One such Jersey bookie, whose face is shielded for obvious reasons, says he and his partners take in $40 million to $50 million a month in handle.